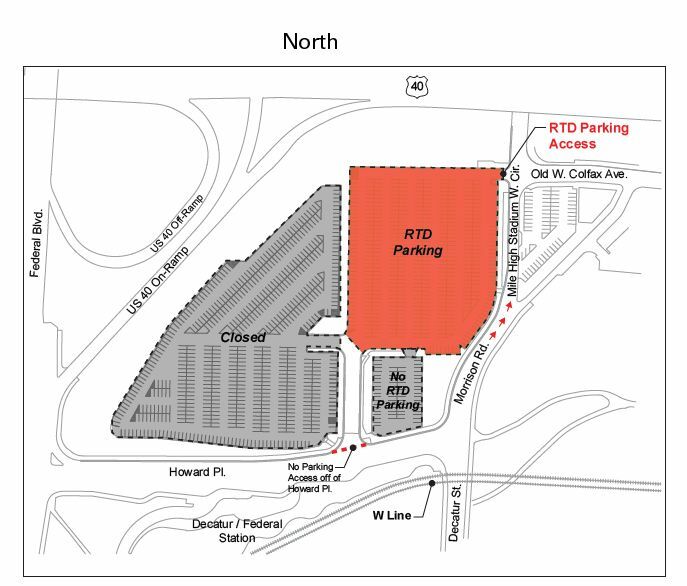 Parking will not be available to RTD patrons at the Decatur-Federal Station between 1:00 a.m. and 11:30 p.m. on all Denver Broncos preseason, regular season, and post season home game days, and during major events at Sports Authority Field at Mile High. Unauthorized vehicles may be towed at the owner’s expense. ** During all events with 20,000+ attendees, Zoning Enforcement and Right of Way Enforcement will be scheduled and parking restrictions will apply. Vehicles that are illegally parked in the neighborhoods surrounding Sports Authority at Mile High may be ticketed and towed. On December 10, 2016, the northwest parking lot that is bordered by Colfax Avenue and Howard Place was permanently closed due to construction the property. Parking is still available in the northeast lot, which has approximately 461 parking spaces. Access to the lot is via Morrison Road to Mile High Stadium West Circle and Old West Colfax Avenue.